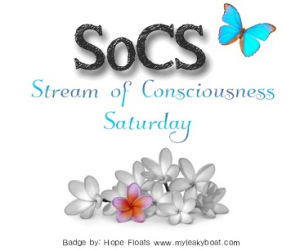 Your Friday prompt for Stream of Consciousness Saturday is: “indescribable.” Use the actual word in your post or just base your post on something that defies description. My suggestion on this one; think about something that you’re passionate about and just start writing. Have fun! Oh yeah, I got this one. My first thought was about that candy bar that was Indescribably Delicious, you know, Mounds. I immediately started humming “sometimes you feel like a nut, sometimes, you don’t. Almond Joy’s got nuts, Mounds don’t.” Sometimes, I feel like a nut. 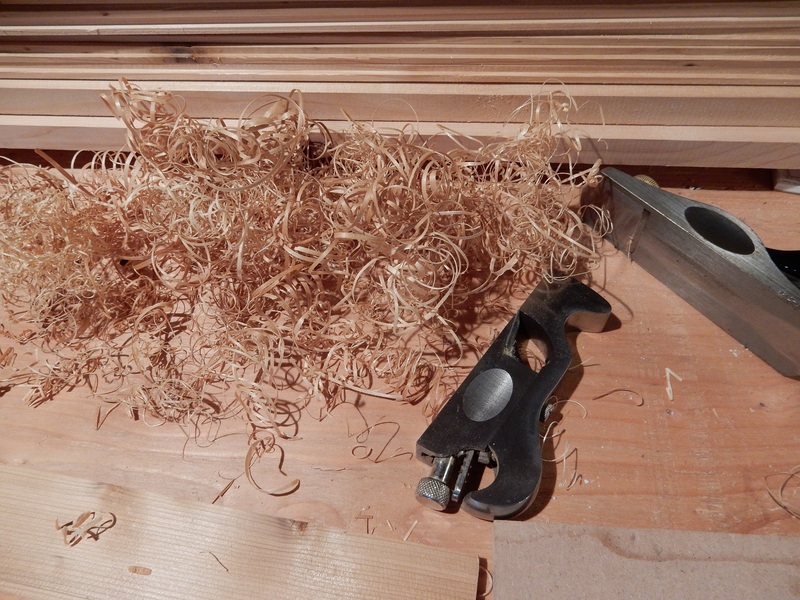 Using a plane, a spokeshave or a really sharp chisel – If you have used one of these tools, you know the feeling. Well, maybe you know the feeling. You know a feeling. I’m not sure it’s the same feeling I know, but you know. The sound, the feel, the transformation happening in front of your eyes, guided by your own hand(s) and the certainty of the curling evidence being left behind. The view from the top – This summer, my daughter reintroduced me to hiking. Granted, I only made one significant hike with her, but I was able to experience the view from the top. I can show you pictures of it. I can tell you what it was like, but I can’t describe how it felt. The satisfaction. The wind. The realization that we had to hike back down and that that was going to be harder in some ways than hiking up was. Fair food – If you work hard and choose your words carefully, you can describe a good meal. Restaurant critics do this every day. There’s a whole vocabulary dedicated to conveying the presentation, texture, spices and flavor of a fine dish. There’s nothing that adequately describes a sausage grinder, cooked on a flat-top grill that makes you think: “it’s probably not clean, but how many germs could live on that?” served in a napkin and eaten while walking along the midway. It doesn’t get any better, and yet it’s indescribable. You have to have been there and ate that to understand. Fresh tomatoes – Not fresh form the store. Not even fresh from the farmer’s market. No, I’m talking about fresh from the garden. Your garden, or in this case, my wife’s garden. Cherry tomatoes, picked off the vine and eaten while walking the dog around the yard. Fresh large tomatoes cut into a salad, stirred into a sauce or sliced onto a sandwich. Fresh bread, oooh add that to the list, ‘cuz there’s no way to describe the smell and warmth and sensory overload associated with homemade bread. Oh, I got off course. Fresh bread, real butter – we get ours from a farm, nothin’ but moo – and a few generous slices of right-off-the-vine tomato. Earlier this year, a fellow blogger mentioned butter, peanut butter and tomato sandwiches. Don’t knock them until you try one, because they’re, well, you know, indescribable. I cleared the table so I could use my laptop. That look – You know the look, the one you get from your wife, your mother, your child, the dog or the cat. Yeah you know. The look that sends shivers down your spine. The look that says you’re probably not going to die, but if it were an option, you might consider it. The look that tells you that everything in the world is about to change and you can’t stop it. You can’t describe it, but you know it’s going to happen. Draft beer – Not just any draft beer. Not even your favorite draft beer. I’m talking about the indescribable feeling you get when there’s an unexpected beer on tap. I was in New York earlier this week. When the waiter asked what kind of wine I would like, I replied: “what kind of beer do you have on tap?” It was one of those places where, when you ask for beer, you get that look. Not that look, not the world changing look, but that other look. The one that says this waiter’s opinion of you just dropped. As he rambled through the list, I heard a mumbled “Brooklyn Lager.” Stop the presses. I’ll have that, Brooklyn, yeah, that’s the “wine” I want. That sound – Fortunately, I don’t know what this feeling feels like but I was there when our daughter Faith, dropped her iPhone on the unforgiving hard floor of my garage. I can only imagine. In other words, indescribable. Now I have to find some pictures. Fresh tomato, fresh butter and peanut butter. Very good on a toasted muffin. He said if I took a photo of the sausage, I had to take one of him. Nice, ripe, warm cherry tomatoes eaten in the yard – YES! We visited Smuttynose Brewery on Veterans Day, and when the waitress was reading through the list of beers on draft, it was indescribable. I had a nice Pumpkin and hubby enjoyed Old Brown Dog. :-) Happy weekend. With me, it’s my other half saying, “Now…” and then a pause. It is the chilling equivalent to The Look!!! There’s always a warning but the door is never close enough. Thanks for dropping by today. YOU ARE KILLING ME HERE. I love everything you have mentioned as indescribable. Those tomatoes are to die for. I used to grow my own and miss them. (They don’t do well in the salt air). By the way if the wait person has a problem with a beer drinker it’s his or her problem. Thanks John. I’m glad that I don’t have to try to describe these things. I appreciate your comment about the waitstaff. Sorry to hear that tomatoes don’t do well in the salt air. I guess that makes sense, but I never would have thought. Ha, what a cosmopolitan list, Dan — from candy bars to mountain tops to fresh tomatoes to intimidating looks! The world is truly full of things that defy description, and if finding Brooklyn Lager lurking on a wine list isn’t one of them, I don’t know what is. My list would include the experience of reading a No Facilities post — I would tell people, “No, you just have to read it and see.” Good stuff, as always! Ha ha. Thanks Paul. Always good to find a like mind, especially with respect to Brooklyn Lager. I remember that feeling I had early in the morning, running a trail through the Minnesota River bottoms. About mile five, everything clicked. I love Saturdays because first thing, you provide me with a guaranteed chuckle, or many in this case. The picture of your cat…perfect. 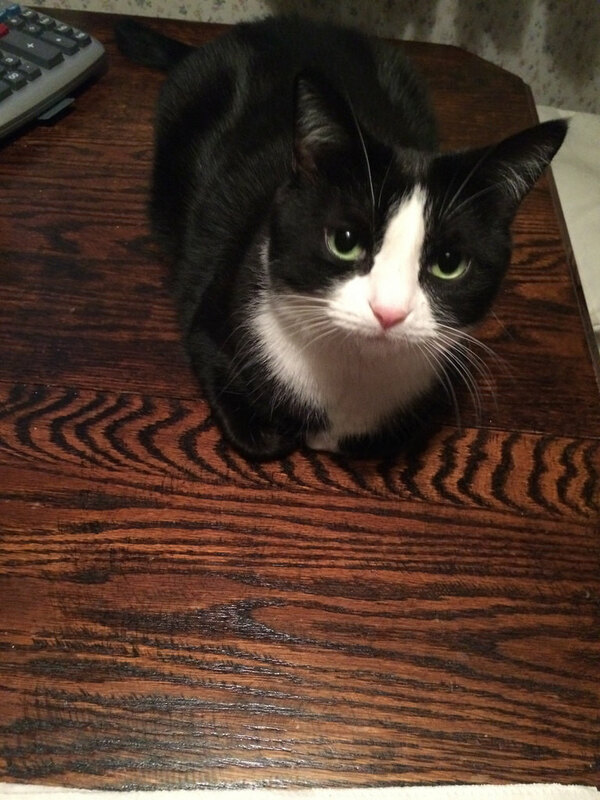 MuMu (the featured kitty) can give a look that stops me cold. Thanks Elizabeth. Stunning cat. But tomatoes and peanut butter? I’ll have to try it (fresh tomatoes year round here). Is that your invention? I hope Faith received a free replacement for her iPhone. MuMu appreciates your compliment as much as any cat shows appreciation. The sandwich idea is not mine, but it became a favorite this summer. I’m jealous of fresh tomatoes year round. We go from vine ripened to ripened-in-the-truck between the fid and here :( Faith did not get s free replacement but did get an affordable one. Thanks !! This was a great prompt today, and I enjoyed how you turned your answer into a list, Dan. I really do love lists. You’re making me want to try this tomato/peanut butter concoction. Also making me wish there was nearby fair! I’d have to skip the beer, of course (yuck), but I do know that feeling when you pick up a super-sharp chisel. I also feel that with regular kitchen knives. Nothing is worse than a dull knife, so when your perfect roast comes out of the oven and the knife slices it like butter? Yeah. THAT. What’s indescribable for me is that feeling I get when I drag the boxes of Christmas decorations out of the closet, open them, and catch the first whiff of tinsel. You know, that oddly warm, metallic scent? It makes me giddy and happy, and well, the rest is indescribable. And as luck would have it, today is the day for that feeling. Thanksgiving is long past, Remembrance Day is over, and heck, there’s even a skiff of snow on the ground. So if anyone needs me, I’ll be in the closet, wrapping myself in garland and breathing deeply. Thanks Wendy. Sharp tools of any sort are s pleasure to deal with. I’m resizing some of the firewood we just bought (too long for stove) but I’m using my new chainsaw for the first time. We still have Thanksgiving on the horizon so no Christmas decorations yet here. Dan, I’m right there with you about fresh tomatoes! One of my favorite things in life. That’s a good list Teagan. I use alma-seltzer cold medicine and j still sing plop plop fizz fizz. Thanks for stopping by. I hope the rest of your weekend is great. You just had to remind me of that nut thing, didn’t you. Now I have to hear it in my head. AAAAaaaaah! This was awesome, Dan! The look, the sound, the taste–fantastic. My son and I love going out to eat and try to figure out the spices used in cooking..my husband just eats. He doesn’t get it. And how come I’m the only one who can sit bolt upright in bed at night ands say, “Did you hear that–Parker just got sick.” Nope, he doesn’t hear a thing. Great uplifting post to read for me when all I think about is France. Thank you. I know it’s accidental that your post arrives right after but this nice to read about tomatoes and mountains and cats and so many good things of life. Thank you Evelyne. My heart goes out to all of France but especially to the people with whom I’m connected through this and their blogs. I wish there was something good to say. Our thoughts and prayers are with you all. I’m a sucker for a Mounds bar and cherry tomatoes fresh from the vine too! I usually feel like a nut but I’ll eat either one of those if it’s in front of me. Thanks for stopping by today. Fresh tomatoes…Mmmmm. Unfortunately, mine have to be from a farmer’s market, which is okay. There is an organic stand that I frequent, and this summer, I found these tomatoes….smaller than regular size, bigger than cherry size, bicolor (red and brown), sweet as a plum and extraordinarily delicious. I hope they have them again next summer. We do frequent a farm stand, especially early in the summer. It’s so good. The tomatoes seem to be the big hit today. Thanks for visiting. I’m glad you referenced food so much. You know I’m in agreement about the fair food, but I started salivating after tomatoes fresh from the garden. Hands down, my favorite thing about summer (and you know how few they are for this Heat Hater) is fresh tomatoes from the garden. Even picking them. Mercy, the smell of fresh tomato stems has got to be one of my top ten. I even bought a soap that smells like them. Nothin like that smell. Before they’re even ripe, I’m out there bristling the stems in my hands just so I can take in the smell. Fresh butter is rare here, and when we do get it, we don’t even share, lol! And Mounds bars, of course. But homemade coconut covered in chocolate is even better. Ooh, I’m ready for dinner, Dan! Wow, you are serious about the tomatoes if you bought that soap. I didn’t even know that there was such a thing. There was a cherry tomato plant near the end of the garden, so I could pick some as Maddie and I walked by. If you can get dairy fresh cream, you can make butter very easily (he says as if he does it all the time). My wife has made butter. Just pour the cream in a mixer with a whisk attachment. Just let the thing run. The cream will separate and in a little while, butter will ball up on the whisk. My wife rubs some coarse salt into it, and it’s great. Thanks for stopping by. I hope you ate well tonight. Oh my, Dan! As soon as you said the prompt, I think advertising really influenced my brain!! I thought of Mounds bar, too. I did not go on to the Almond Joy, but can see why your mind kept going that direction. Tools that you enjoy are interesting, for me the paint brushes and paint coming out of my art drawer. In the old day, stickers of all sorts to decorate students papers, knowing they would be excited makes me excited. My favorite shivering and sort of indescribable occurrence is when a child asks me to listen to a secret, when I lean down and their breath enters my ear, I feel happy, giddy and cannot truly describe the warm feelings overwhelming me. I have even had tears cone to my eyes before. . .
You heard the commercial as often as I did Robin – it’s never going away. I can almost picture you leaning down to hear one of those secrets. That must be special. Indescribable moments that you described so I understood exactly what you experienced with nary an adverb and, if an adjective was present, I missed it. Now that’s powerful writing. I just got a wonderful sunrise this morning while out with the dog. When Yuengling was just making its way to CT, that was a series of surprises, bar after bar. I’m trying to think if I’ve ever seen Corona or Corona Light on tap. Thanks for stopping by today. Watch out for that look. Thank you for dropping by. Now, I want an ice cold beer (it’s 6:45 am). I love looking at the pictures you share from those hikes. Reading your post before I call it a day. Extremely busy here, not because of Diwali celebrations, but working throughout the weekend. Great post btw. Sorry to hear that you’re working. Thanks for stopping here. Well, how can I miss your posts. When I am done with a taxing day, I look out for some entertainment, I love your sense of humor and style of writing. All feelings well transferred, thank you. Thank you. Maybe that’s the reason writers struggle. The tomatoes were pretty popular. I get that feeling when I complete a manuscript. It is an intense feeling. Euphoric. Unfortunately I haven’t written anything since March. I feel awful about it. Really awful, guilty even. I look at a blank screen and no words come. Instead, I begin to seek distractions. Scrabble, music, movie. It’s ugly. I can’t write. Then there is work. More responsibilities at work. I think I’m dying by inches. Peter, that is so sad. I miss your writing. We all do.